The Greek word translated “faith” is pistis, and it simply means “trust.” In what? A rational, intelligible promise. Faith is not superstition. Nor is it as modern dictionaries say: “A belief not based on reason.” Just the opposite. When God says, “Take my Word for it,” faith says YES. Because God gave man free will, faith is the simplest thing He could require of us as we relate to Him and Jesus Christ. We are not robots, and God is not controlling our lives. Faith is making your say-so line up with God’s say-so. Faith accesses God’s promises and God’s power. God goes first and makes a promise, like, “I gave my Son for you, and if you make him your Lord, we will save you and guarantee you everlasting life.” Now it’s your turn, and you actually have three choices: You can say, “No way.” Or you could say, “Great!” and not do it—that would be only mental assent. Or you could do what Romans 10:9 says and confess Jesus as Lord, believing that God raised him from the dead. When you do, the ball is then in His court, so to speak, and He keeps His Word by filling you with His divine nature and giving you the guarantee of salvation. Faith is not a force. It is not a creative mental power that affects anything outside your own skin. Your thoughts definitely affect your own body, as per verses like Proverbs 17:22 (NKJV): “A merry heart does good, like medicine, But a broken spirit dries the bones.” But there is no power inherent in your thoughts that directly affects anything or anyone else. 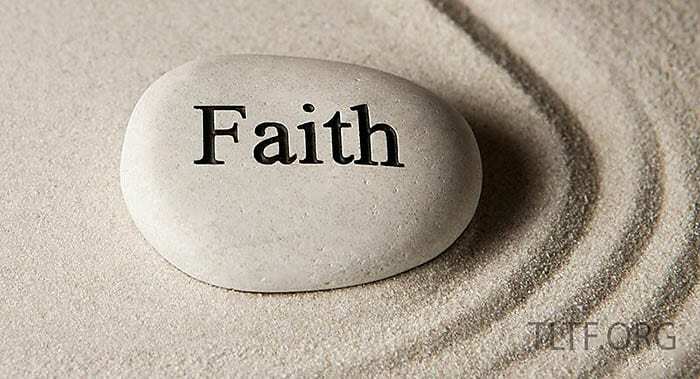 By definition, faith requires an object, and the object is the Word of God to man. The so-called “Secret” is very big today, and there is even an official website. Supposedly, it is “The Law of Attraction,” i.e., what you think is what you get. If you really think about that, you know it doesn’t always work that way. That’s very heady when you get what you want, because you can take credit for it, which kind of makes you God. But it is very deflating, if not devastating, when tragedy comes your way, because you must take credit for that too, which kind of makes you the Devil. The assumption is that some kind of creative power is somehow generated within your mind, and that power somehow goes forth to somehow affect the red Mercedes® you are visualizing as parked in your garage, or when you go to the dealer, tell him why it is now yours, and attempt to drive it off the lot. The problem is that no one can define what the power is or how it works, so the whole thing is made up. By whom? It’s basically the same old, same old lie Satan told in Genesis 3:5, “…you will be like God…” i.e., you can take matters into your own hands and create your own world, independent of God. There is no such thing as “mind power.” God designed your mind to trust His Word, and that is faith.